Call 323-735-0500 or email nicole@yogaforyouth.org for details. 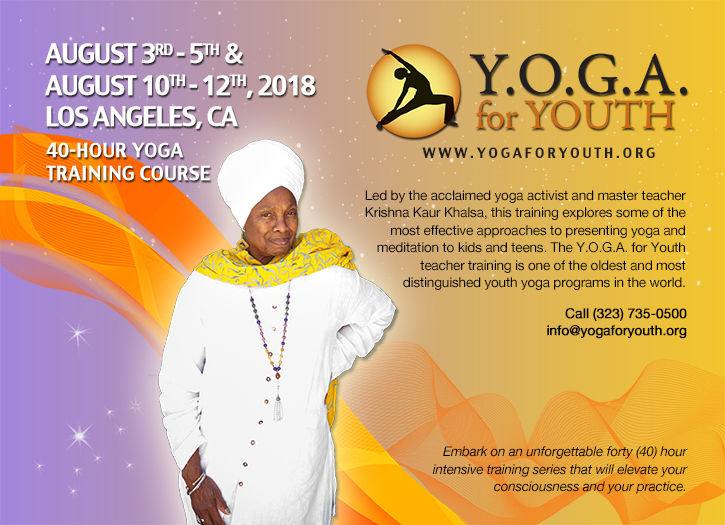 Led by the acclaimed yoga activist, level 2 master yoga teacher and trainer, Krishna Kaur Khalsa E-RYT, the Y.O.G.A. for Youth Teacher Training program is one of the oldest and most distinguished youth yoga programs in the world. With more than 30 years of youth yoga instruction under her belt, the Y.O.G.A. for Youth Founder and Chairman is regarded as one of the top 25 master yoga instructors on the planet. Embark on an unforgettable forty (40) hour intensive training series that will elevate your consciousness and your practice. This training explores some of the most effective approaches to presenting asanas and kriyas to youth. It will enhance your teaching ability and expand your knowledge of yoga across multiple disciplines. The main area of focus will be on developing tools that will assist you in translating ancient yogic principals into a language youth can understand and apply to their daily lives without diminishing its powerful effects. An emphasis will be placed on specialized programming for under-served, “at-risk” and traumatized youth populations. This training will not only introduce you to the policies and procedures of teaching in secured facilities, but it will also prepare you to effectively deliver creative and dynamic youth yoga classes to diverse populations with a massive impact. Elevate your teachings and set yourself apart from your fellow instructors through the Y.O.G.A. for Youth Teacher Training – a program scientifically proven to deliver “significant results” according to Dr. Sat Bir Singh Khalsa, Harvard University.